In today’s world, life moves fast. With our endless to-do lists, busy schedules and electronic distractions, it is easy to overlook scheduling family portraits. So often, people assume getting everyone together as a burden, or a chore, that is one task too many. It is easy to focus on the negative aspects of booking a family portrait session. But parents rarely consider the confidence boost that family portraits can offer. Having family portraits taken can help to foster communication and increase children’s’ self-worth. Over the years, psychologists have done research that shows family portraits can boost happiness and self-esteem in children. In 1975, a well-known study was conducted with a group of fourth graders in a Murfreesboro, Tennessee school by Tulane University. The children were selected to participate based on low scores on a self-esteem test. They were given Polaroid cameras with an assignment to take pictures of themselves in a variety of poses that expressed both different and specific emotions they were experiencing. Over the course of five weeks, the children used those sixty pictures of themselves to create scrapbooks. After the five weeks had passed, the students were tested once more. Not surprisingly, the students' test scores showed a significant increase in their behavioral self-esteem. So what does this mean for family portraits? The Murfreesboro study underscores that just being surrounded by pictures of themselves can encourage children to have higher levels of self-esteem. The book, “Photo Therapy and Mental Health” co-authored by Dr. David Krauss and Jerry Fryrear is considered a founding text for the use of photography in therapy. Dr. Krauss strongly advocates for having family photos displayed in a gallery. "What it says to a child is, 'I'm important in this family,'" shares Dr. Krauss. Family photo sessions help to create a stronger bond within families. They allow children to see and feel the security and their place within the family. Taking these pictures and displaying them prominently throughout the home can show children how valuable they are to the family unit. Being able to look at their photographs allows a child (even a young child) to comprehend where they fit in and the importance they bring to the whole family. "It's important not only to be photographed in ways that indicate caring, nurturing, love and success but also to see those images and take them in," Dr. Krauss had stated. When portraits are hung up, words are not needed to express the affection within the family. The love is visible in the smiles on the walls and in the stories that line the hallways. When decorating children’s bedrooms and nurseries, keep this in mind. 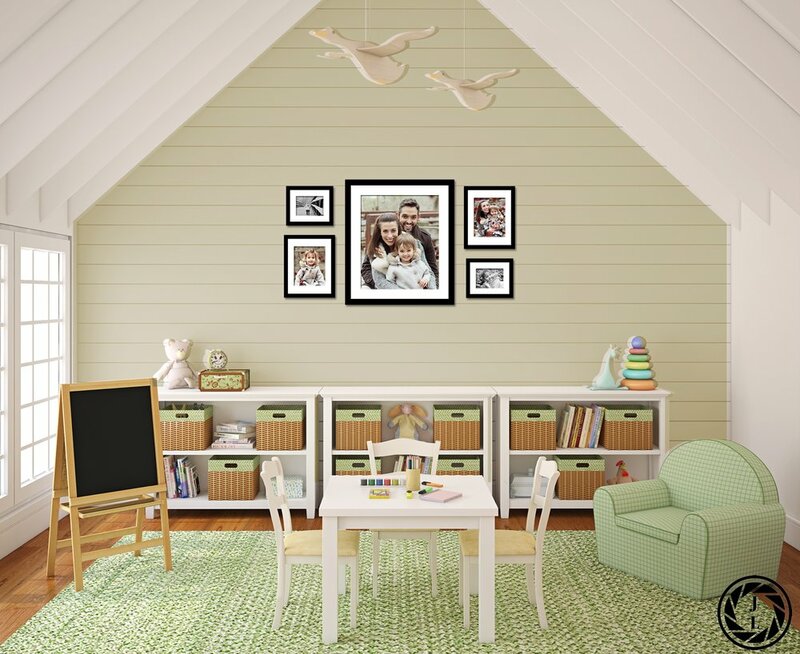 Including family portraits in their rooms is a way to show children how much they matter. Family portraits help to cultivate conversations of genealogy and how every family has a unique and compelling history. It solidifies the value of making and honoring memories. My own home is full of images of my family – members who are here as well as deceased. These images spark conversations with my daughter, who is only two-years-old, about the love I have for my Grandmother who has since passed. It gives me a chance to share with her the comedic nature of my Great Uncle - who also has passed. I have images of relatives we do not get to see very often. We speak about them to develop my daughter's relationships with these loved ones, even with little face time. Having these images of treasured family members helps us to continue to honor their memories and to keep these relationships front of mind. By printing your family portraits and using them around your home, it sends a message to your children that family is essential. Even babies can recognize themselves in a mirror or photograph. Their faces light up in a moment of delight. Being able to look at and see pictures of themselves in the home can help instill a sense of self and to reinforce they are valued members of the family. In my home, I also have created a magnet wall for my daughter with magnets of her, her family, and her friends. She gets to play with the magnets, speak about the people and the stories she creates with them, and learn about the people on the magnets through this fun activity. Even though it is meant as a game, it allows her to interact with those images and to express herself as an individual. Seeing the love and closeness of a family unit on the walls deepens a sense of home and comfort. Every child should know the security of home, and this is reinforced every day they see those pictures. There is something connective and powerful with physically being able to touch a print. It sparks emotion and helps children to step away from technology momentarily. Printing images can become a family activity to decorate with personalized art. Family portraits can boost self-esteem, strengthen family bonds, create conversations about family and reinforce a sense of self in children. I would be honored to help you seize these moments for your family. Time flies so quickly! As a family documentary photographer, making sure these precious moments are captured and preserved is essential to me. Please do not hesitate to reach out for more information.